Lately quite numbers of rainbow bakes appear in blogging atmosphere. Rainbow breads, cakes and even cookies! 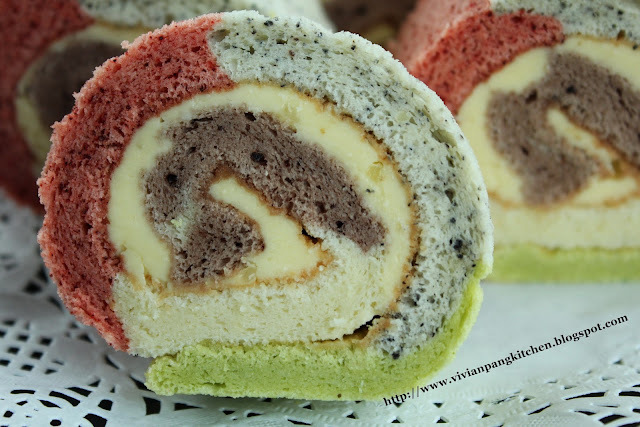 Those colourful bakes inspired me to bake my 1st rainbow Swiss roll :) Instead of using artificial colouring I used natural colouring which I can get from fresh ingredients. Green from pandan juice, black from black sesame seed powder, red from red yeast rice (红曲米) powder and brown from cocoa powder. *blend few pandan leaves with water and keep in fridge for 1-2 days. Used the liquid(concentrate juice) that sink at the bottom. Beat butter and sugar till light. Add in whipping cream and beat till slightly thicken. Keep in fridge for later used. 1. Whisk yolks and castor sugar till well combine. Add in vegetable oil and mix well. 2. Whisk in the sifted flour and milk in 2 batches alternatively. 3. In other bowl beat the whites till foamy. Add in 1/2 the castor sugar and vinegar. Continue beat till glossy. Add in the rest of castor sugar. Beat till stiff form. 5. Divide batter into 5 portions (about 80g each). One remains plain and the rest will be coloured batter. Add the natural colouring agent as stated above. 6. Pour the batter into lined and greased swiss roll pan (I'm using 30cm x 36cm) as shown. Smooth the surface with scraper (careful not to mix up the coloured batter). 7. Bake in preheated oven at 180C for 15 minutes. Turn the heat to 200C and bake further 3 minutes. * I'm using steam bake method. Bake the cake at the middle rack. Place another pan with hot water at the bottom of oven. * I bake further with higher temperature to get brown darker surface. Do adjust according to your oven temperature. 8. Once cooked, transfer the cake by lifting the baking paper (edges) to wire rack. Leave to cool (about 5 minutes). 9. Invert the cake and gently remove the baking paper. Invert the cake with baking surface on top. With a knife cut 2 lines (at the beginning of rolling point) but the cake is still attached to each other. Spread the filling evenly on the surface. Leave 1-2cm remain unspread. 10. Hold the cake with both hands with the help of rolling pin and roll gently (click here for the picture on rolling step). 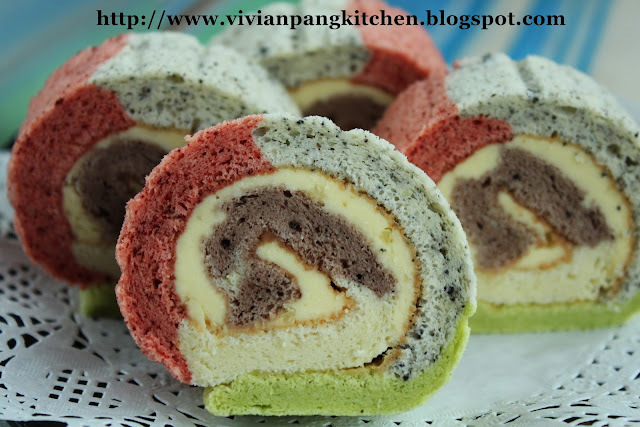 When the swiss roll is rolled up, make sure the ending portion facing downward. Keep the roll in the refrigerator at least 30 minutes before cut and serve. Vivian, I like the colors of this cake. You have poured the different batters so neatly and it comes out so lovely. 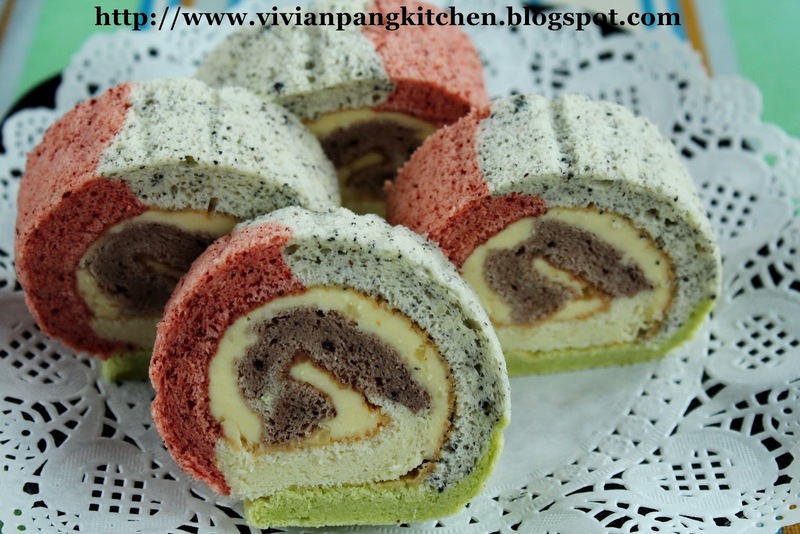 This is a very lovely Swiss roll..
You are so creative in using this natural ingredients to get its natural colour. these rolls are beautiful! sometimes i wish i can be a little hard working to make something rainbow using natural colours too..thanks so much for sharing! wonderful job done!